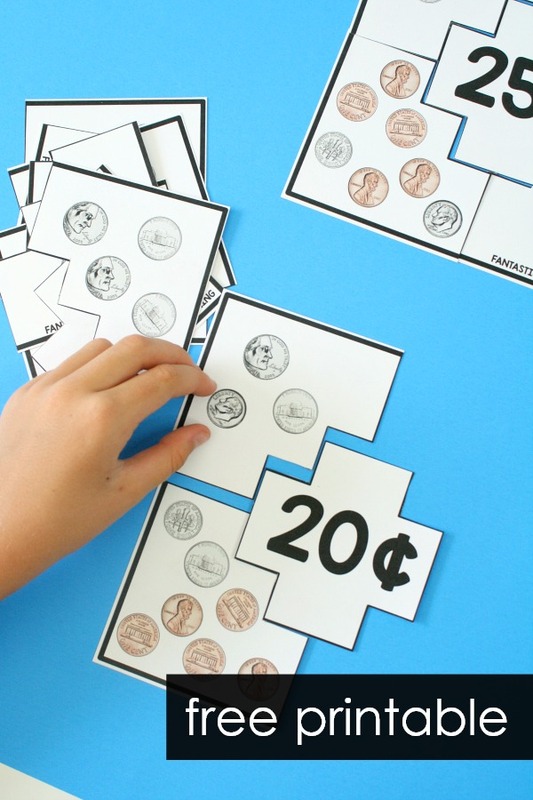 Learning about money can be a challenging task for kids. Because it is symbolic in nature kids can struggle with the concepts. 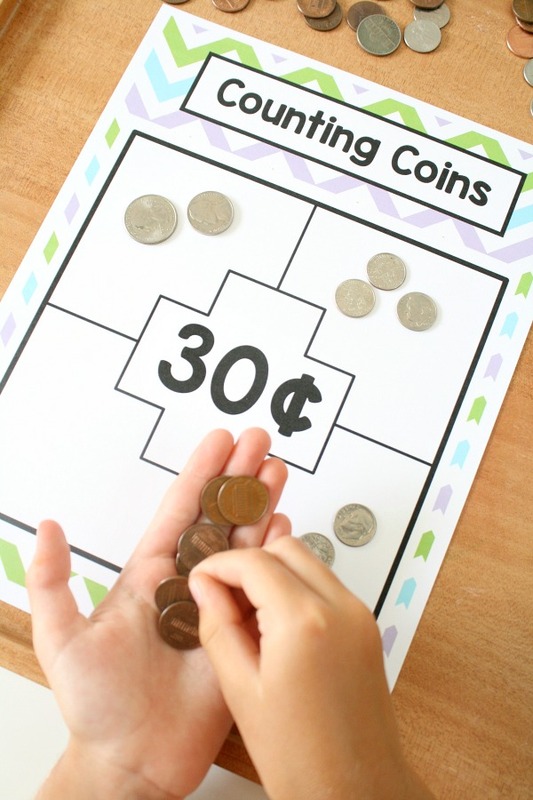 We recently shared some free coin sorting and matching printables intended for kids who are beginning to identify coins and their values. But what next? Once kids know the values of different coins you can begin introducing them to counting money, but start with small amounts! 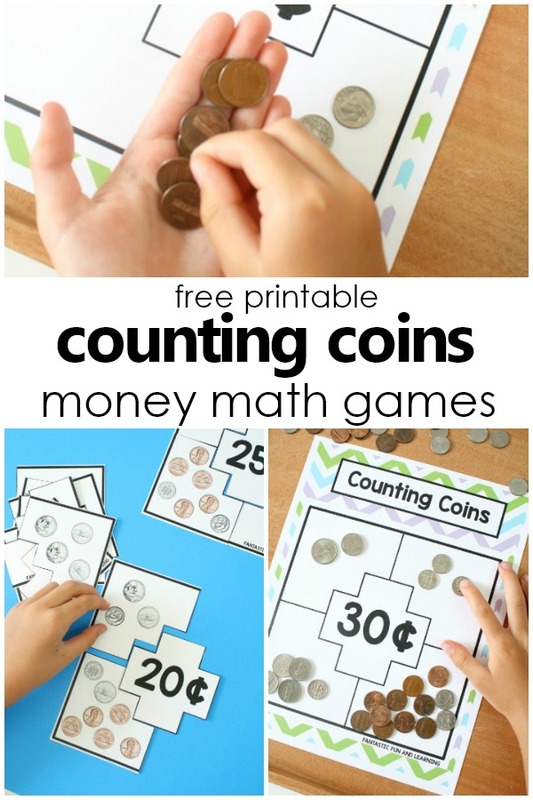 With these free printable counting coins money games we’ve included two different options for kids who are ready to start counting money. Skill levels and readiness vary but this type of activity is typically age appropriate for first grade and second grade learners. We started first by gathering some coins. You can use real coins like we did, or substitute with plastic coins if you prefer. 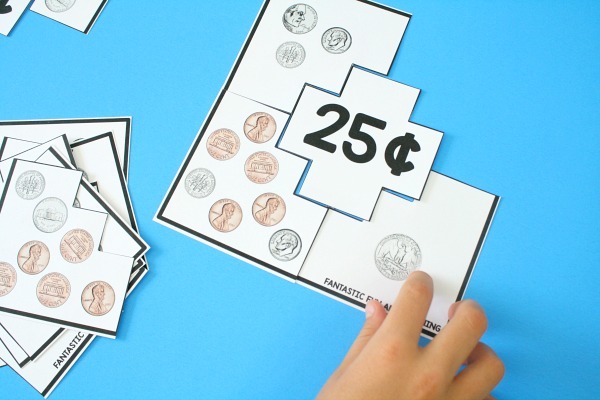 In game 1 we cut apart the puzzles to make a a set of counting coins puzzles for kids to use. You can first use them in small group or whole group to introduce and practice counting sets. I like to use 2 or three full puzzles (depending on the number of kids you are working with). I put the amount segments (25¢, 30¢, etc) in the middle of the work space. Then each child gets at least one puzzle piece and counts the amount represented on the piece. Kids take turns counting the set on their piece orally and placing the puzzle piece where it matches. This is a good way to get kids started with the activity without it being too overwhelming for them. 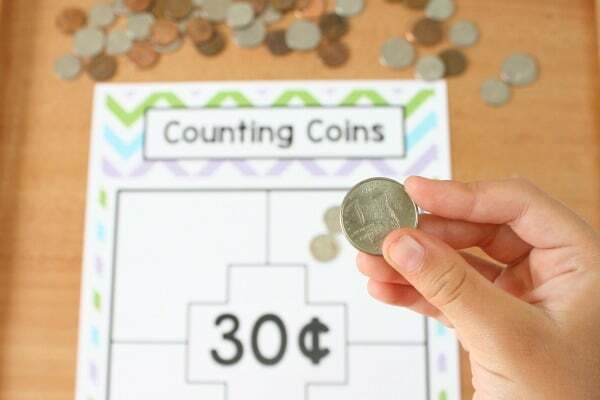 Once kids begin to show an ability to count coins independently this activity can be added to a math center or be sent home as a homework game. 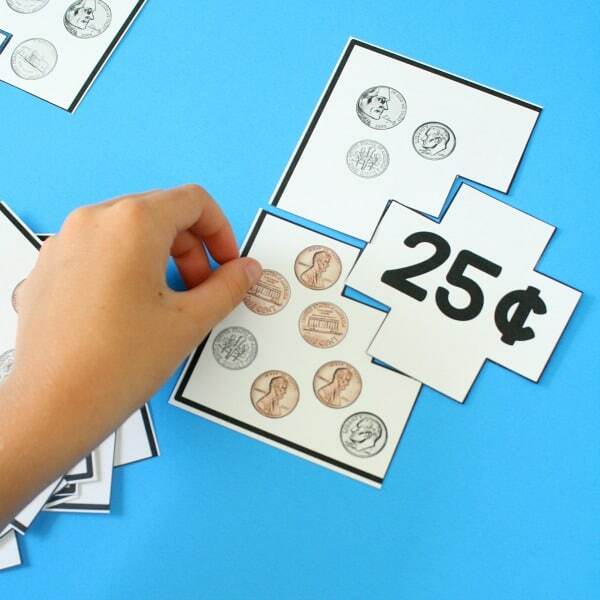 While the counting puzzles above focus on counting sets of coins, they do not require the higher level thinking of creating unique sets of coins. Using the counting sets game mats is a way to increase the difficulty of this task and differentiate instruction as needed. 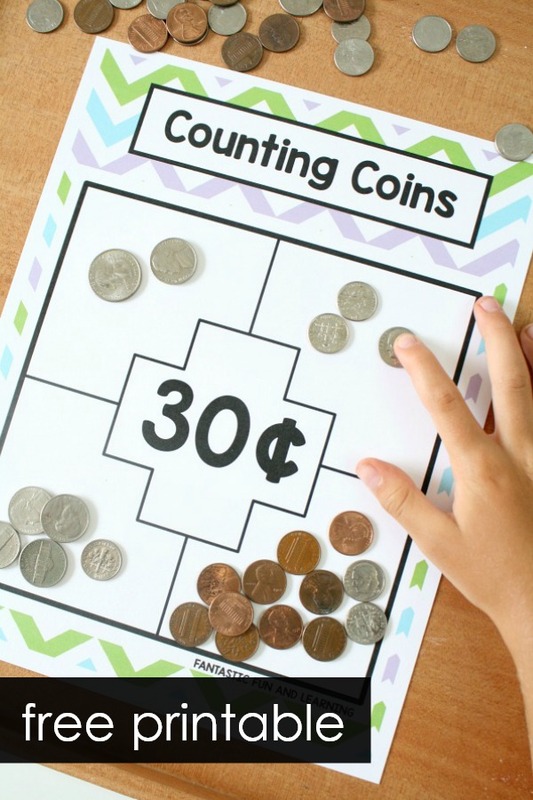 For this activity kids are given a mat and asked to count out four different sets of coins to show that same amount. This can be challenging at first. Like the game above you can start this activity in whole or small group and then transition to independent work when kids are ready. The mats also work well for partners as they can work together to come up with ideas for filling each box and help check one another’s counting. Quick note about coins…I do use a variety of coins so kids can see the different variations that are out in circulation. We use the older and newer nickels and different quarters so kids develop familiarity with them. As kids are counting I always love to watch for signs of the way they are thinking and the ways the approach tasks. This little one naturally created each set in her hand instead of counting the coins out on the mat. They were never placed on the mat until she had her final set of coins ready. Although it looked a little hard to hold to me, I thought it was an interesting way to approach the counting. Once kids are finished with their mats I do always encourage them to go back and check their work. It’s a great habit to get into from an early age, and it gives them some additional practice in counting the sets fluently. 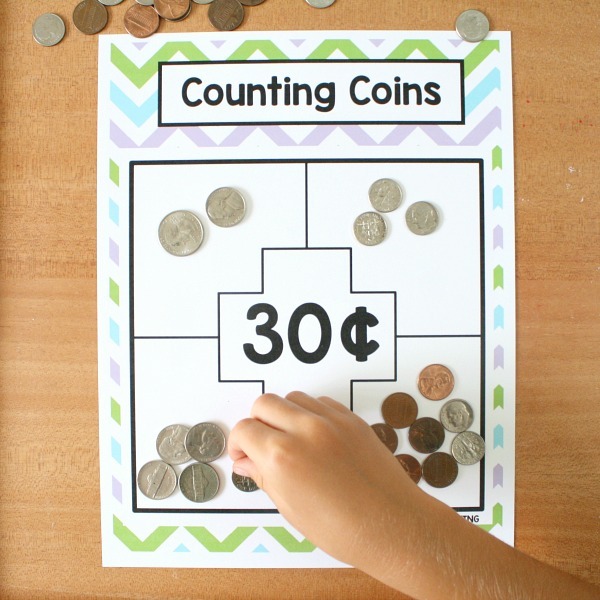 Used as a work mat for kids to create their own combinations of coins (real or manipulatives) to match the amount. 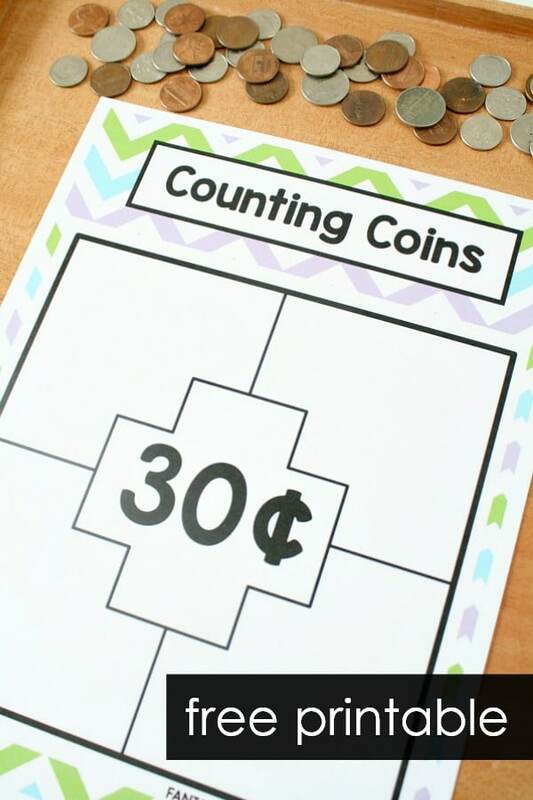 Printed on white or colored paper to save ink and then used as a work mat for kids to create their own combinations of coins (real or manipulatives) to match the amount. I am trying to print the free coin activity. I am not able to print the matching activity out. If you have the download and it is not printing correctly, try updating your version of Adobe Reader.